@41 mos - 2011 GWAS Color Champ (Level 5)! He is carrying so much fiber he's a puffball! Alexander the Great has a consistent, beautiful stamp in fleece and phenotype, all gorgeous, letting the dam's color come through while holding low microns and SD's into his middle years now, he seems to be passing his magnificent histogram detail on to his cria. He readily produces distinct merino-type fleece with TINY bundles past maturity and high frequency crimp with excellent amplitude. "The Future of the American Alpaca Industry! This is what we should be breeding for. He has nice match-stick bundling which is an indication of his density. You must get your hands on him! 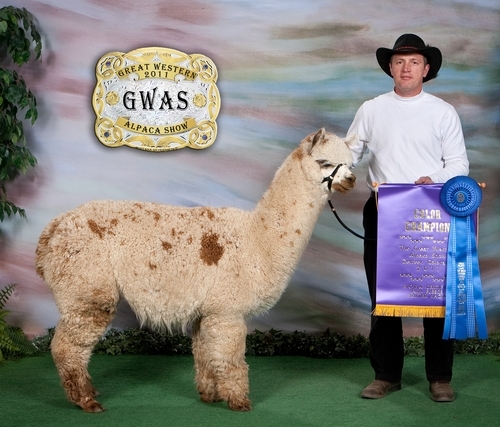 He has nice confirmation, but his true strength is his fiber.” Judge Jill McLeod - Alpaca Mania 2004. Alexander is full accoyo, son of 4Peruvian Pachacuti 6011. Pachacuti's fleece is dense, bright, and fine! He has a picture perfect Accoyo head, with crimpy locks all over his big frame. Pachacuti's cria have been uniformly outstanding and some of the best examples of the Accoyo line. Pachacuti passed away October 2008. Alexander’s dam is Sierra, a PPeruvian Vengador G4568 daughter. Vengador needs almost no introduction to those that have been into Accoyo bloodlines. He held his fine handle well past 10 years of age. Vengador passed away in 2009. This herdsire was truly a huge part of the foundation herd in North America. His genes are found in many of the bloodlines in this country. Co-Owned with Alpaca at Dancing Meadows. Beauty is a wonderful girl who is very nice to work with. She has produced well thus far. We anticipate great things from her. Her fineness comes from her dam. 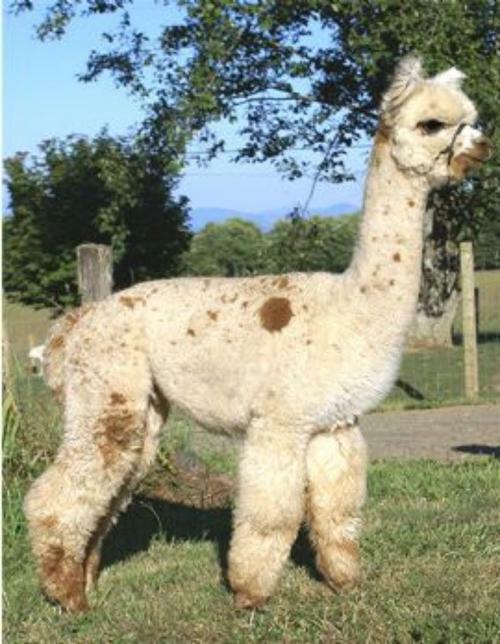 Her dam a black females who is still breeding and producing cria @ 18 had a micron of 24.4 w/a CV of 17.7 @ age 16. Did you notice I said she was black? Beauty is a beauty, she was named before she came out and I couldn't have named her better had I seen her first. She has a nice frame, big boned and very straight. She has very bright white fleece with MF beauty marks just behind each eye. Her fleece has a nice crimp style with medium amplitude. Beauty has had three cria thus far. The first was a solid DF and the second out of the same mating was a White w/DF appaloosa and the third was a solid white female. Beauty's dam is black with a splash of white and her sire is white so the possibilities seemed endless in terms of what colors she could produce. Her dam has produced everything from black to maroon and silver as well as white (Beauty). Our breeding decisions for Beauty has always revolved around improving fleece quality. As nice as Beauty is her fleece could use more amplitude and perhaps a higher frequency of crimp, this year we bred her to Accoyo America Jeremiah. She has nice brightness and luster. A soft handle and great staple length. So, if you are looking for a sweet girl with lots of possibilities take a look at Beauty. The price listed is the 50% discounted price. Purchase 10 or more animals and take an additional 10% off or buy the whole herd and take an additional 20% off. Jacob an excellent appaloosa herdsire. His personality is easy going and inquisitive, and he gets along great with other males. He has a fine, crimpy, and shiny fiber -- which fits well with our breeding program. His abundant spots are distinct, nicely sized, spread consistently across his blanket. 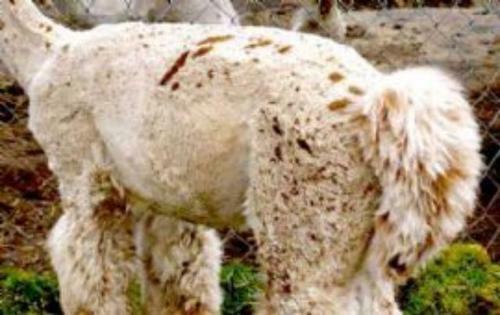 This is why he remains an appaloosa has he ages rather than becoming a solid or harlequin grey as most leopard coats do. His fiber has a tight crimp structure that has maintained well as he matured. 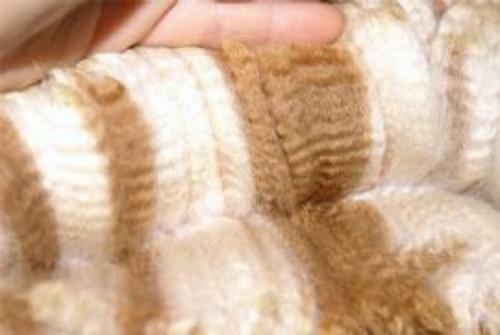 It is so soft, with uniformity of micron between his light and medium fawn areas. His coverage and regrowth in staple length is excellent. When bred to solid dams he produced solid colors and greys, with a base coloration driven by the dam, with his excellent fiber characteristics. When bred to appaloosa dams, Jacob has produced appy crias. Our fawn based appaloosa dam, Imitation, produced two beautiful look-alike girls with dark brown spots on a beige background. 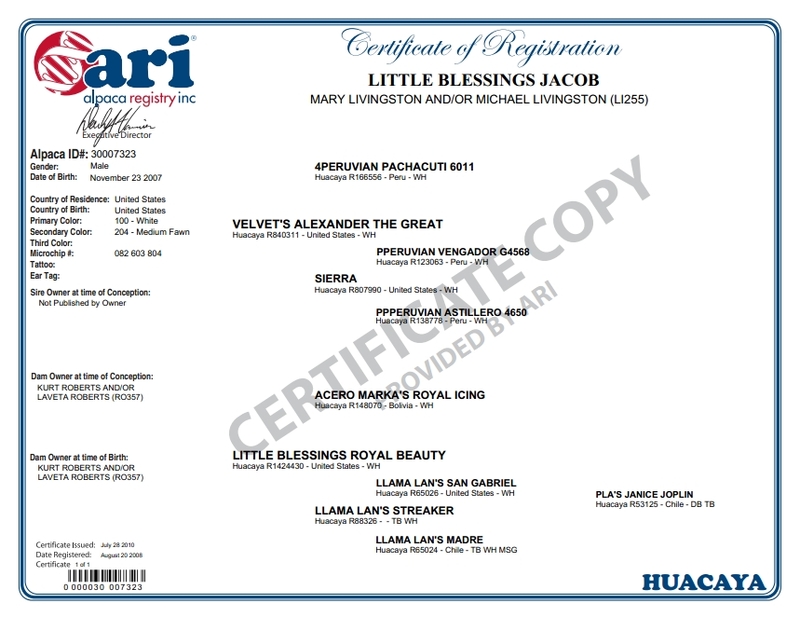 Jacob is available for breedings, and he can be purchased by the right program. 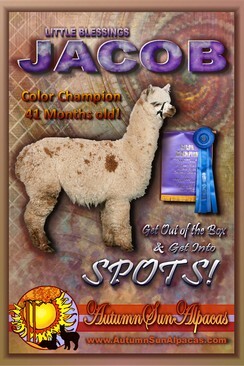 Color Champion -- 2011 GWAS -- all ages in multi/indefinite (light/dark) males! 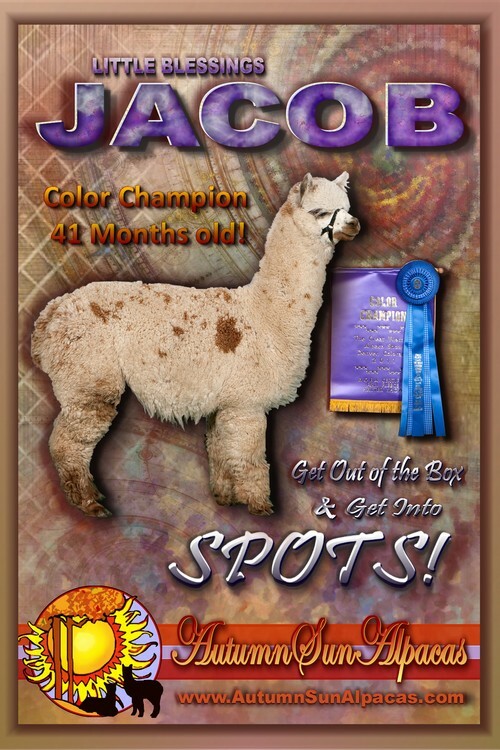 Jacob has fine fleece, with great staple and crimp -- year after year as he matures! This boy is a good fiber choice in a herdsire whether breeding for solid color or not!